I thank the Lord again for my opportunity to serve Him today, and I pray my words are full of His truth today. Often my lessons have some humor, some lightheartedness because I truly believe that being a child of God should be a joyous occasion and bible study should be a happy place. Today’s lesson is from the minor prophet Zephaniah, and I do not know how to present this in a lighthearted way. In many ways, lessons on encouragement and love and kindness are easier to teach than fire and brimstone. One of the things I like about Second’s bible studies is that, if you stick around long enough, we will study every book in the bible every 7 years, including little three-chapter books like Zephaniah, tucked in between Habakkuk and Haggai. It may be a little book, but the first chapter alone has a powerful message. It’s not comfortable, it’s not warm, it’s not fuzzy and feel-good … but it’s the Bible and it’s a Revelation from God and of God. Tim mentioned a few weeks ago if I believed God was still a God of wrath, and I answered in the affirmative. Little did I know that that very lesson would be given to me to study and to teach. I was so concerned about the tone of today’s lesson that I ran it by one of the Second Baptist pastors this week. He made a few tweaks, suggested some small changes, and he is now hiding under his bed waiting for the thunder and lightning to begin. 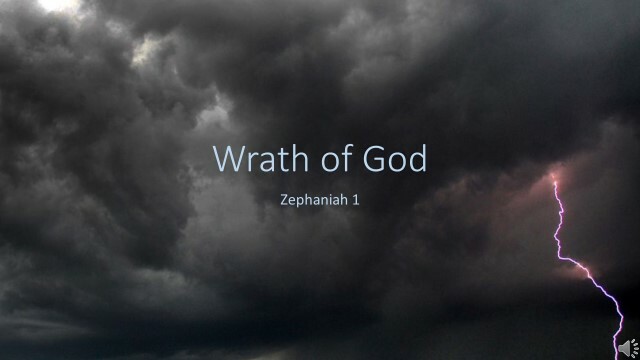 One of his insights, though, was that if I felt that a study of God’s wrath was difficult, imagine what it was like for Zephaniah, bringing these words to the Jewish people? Not much is known about Zephaniah. He lived about 640 BC, he prophesied in the days of King Josiah, and was a contemporary of Jeremiah. The purpose of his prophecy was to speak out against religious and moral corruption and idolatry in Jerusalem. His prophecy was fulfilled a few decades later when Jerusalem collapsed under a wave of immigrants. Let’s turn to Zephaniah 1:1-6 and see the prophecy of the Day of Judgment of the entire earth. Have we been led to believe that our God is only capable of love? That Yahweh is not capable of anger? That Jehovah God incapable of wrath and justice? Do we simply discard scripture that deals with His anger and wrath? Is our God limited and powerless against evil? All this is evidence that God’s judgment is right, and as a result you will be counted worthy of the kingdom of God, for which you are suffering. God is just: He will pay back trouble to those who trouble you and give relief to you who are troubled, and to us as well. This will happen when the Lord Jesus is revealed from heaven in blazing fire with his powerful angels. He will punish those who do not know God and do not obey the gospel of our Lord Jesus. They will be punished with everlasting destruction and shut out from the presence of the Lord and from the glory of his might. Against Pharaoh who had hardened his heart against God, God turned their river into blood, sent swarms of biting flies and frogs, sent locusts to devour their crops, destroyed their vineyards with hail and sleet, destroyed their livestock with lightning. The Old Testament is replete with examples of eradication of sin that sometimes involved destruction. The plagues of Egypt, the destruction of Sodom and Gomorrah, the flood of Noah, the destruction of Jerusalem. Satan is most certainly behind all evil in this world, but Satan uses mankind to carry out his evil ways. God’s fury, God’s burning anger, calamity, and result of his anger is against mankind who serves Satan. God has been unjustly accused by Satan and mocked by unfaithful mankind. We have been offensive and insulting. This pride and arrogance on the part of man leads to calamity, a mighty correction of the perversion of justice we have done. I want you to note carefully here that these plagues are not brought about by Satan, but by God. God is a warrior and will destroy evil. These end times plagues and judgments, the very wrath of God serve a purpose to cleanse His creation of all evil. As Christians, we need to be able to reconcile the God of Love with the God of Wrath. Churches that teach only prosperity or love are teaching a watered down version of Truth that neglects to tell people the source of evil, the effects of evil, and the ultimate judgment of evil. Our God is Love. Our God is Wrath. How do you explain this dichotomy? Or sometimes, the question is phrased this way: How can a loving God send people to hell? We’ll come back to that question, but first, let’s take a look at ourselves. We are made in God’s image, and we know we are capable of love. But if someone lies to us, applies a false label to us, accuses us unjustly, do we not get angry? If we are capable of both love and anger, then it should not be hard to believe that our God who created us can be both loving and full of righteous anger. When he opened the fifth seal, I saw under the altar the souls of those who had been slain because of the word of God and the testimony they had maintained. They called out in a loud voice, “How long, Sovereign Lord, holy and true, until you judge the inhabitants of the earth and avenge our blood?” Then each of them was given a white robe, and they were told to wait a little longer, until the full number of their fellow servants, their brothers and sisters, were killed just as they had been. Here the wrath of God has not yet begun, but just opening the seals of judgment was terrifying enough that people hid in caves and begged for the mountains to fall on them. In Revelation 8-9, the Seven Trumpets then announce the approach of God’s final judgment, and Revelation 9:20, mankind still refuses to give up idol worship. By Revelation 14, the Seven Angels bring Seven Plagues, and Revelation 17 the Seven Bowls full of the wrath of God are poured out upon the earth, punishment to wicked men for their evil ways. And even while the bowls of wrath are poured out over man, man curses God and refuses to repent. We are mankind. We are all sinners, born of original sin. Born to make a choice in this world, who we will serve and honor. We are all born from the father of lies. We are born into sin. We want to sin. We are slaves to sin. In Jeremiah 5:7-9, God’s people have asked for mercy, but God tells them adamantly that their sins will be their destruction. “Why should I forgive you? For we know [God] who said, “It is mine to avenge; I will repay,” and again, “The Lord will judge his people.” It is a dreadful thing to fall into the hands of the living God. Our God is a consuming fire, and we are without excuse. IV. Who then can be saved? Is there no hope? If we are born in sin, and celebrate our sin, and die by our sin, is there no hope? Who indeed? Who is righteous among us if we are all sinners? How do you reconcile the God of beauty, of creation, of truth and righteousness with the God of revenge and wrath and destruction? We need help. If the punishment for sin is death, then we need somebody else to *be* sin and die for us. We need a savior. Somebody fully man who understands life’s trials and temptations, yet remained fully innocent. He would have to be innocent; the guilty cannot take the punishment for another person when he himself is guilty. And not just a man who can take the place of one person, but someone who can take away the sins of the world. We need Jesus. Oh Lord, how we need Jesus. There is cause for celebration in the midst of our message today. Jesus has paid the price for our sin. He took the punishment we deserve. We are saved from the destruction and the wrath of God we deserve. Hallelujah. That’s ultimate love and sacrifice. I stand deserving of the wrath of God for the sins I’ve committed. I deserve punishment. But God so loved me that he sacrificed His only son to take the wrath I deserve. And God so loved you, that he gave up His son to take the wrath for you. Not because we’re such fabulous people, but he did this for us while we were still sinners and deserving of wrath. Why? Because we have a beautiful living awesome God of love and mercy and forgiveness. I don’t know why God loves me, but I am so grateful that He does. He’s forgiven my sins, clothed me in the blood of Jesus, lets me walk boldly to His throne with my prayers, and has made me His adopted son. I am a child of the one true king. Not because of anything I did, but because of what He did. I am no longer condemned. Jesus saves, Amen. We may be saved from our sin through the sacrifice of Jesus, but God still hates sin, even this sin in us. But as children of God, it is not God we war with. We battle Satan and His plans, we put on our full armor of God and brandish the sword of truth. God still hates the sin we think, the sin we speak, and the sin we do. But on that Day of Judgment, we escape the punishment because our savior has already paid for our sins. God’s full wrath was on Jesus that day and God poured out His wrath painfully on Jesus who became sin for us so that we might live. So that no one may perish, He stays his wrath. God has so far exhibited two thousand years of patience with us, but one day God’s justice will demand satisfaction. Time is running out. God loved you will you were yet a sinner; who do you love? God forgave you while you were still a sinner; who will you forgive? Spread the Good News that Jesus loves them, too. They just have to accept the free gift, to allow God’s son to bear the burden for their sin. Evangelize. Save those who you love. And who do you love? Family, friends, and the good book says we are to love our enemies. God gave his son for the world, so that no one may perish. But one day his patience will end. Time is running out. The coming of Man will be sudden, God will call the righteous home and promises that all the indignities that we have suffered, the abuse we endured for His sake, He will avenge, He will make right. His wrath will be poured out. It is not for us to fight that battle; revenge and wrath belongs to the Lord. For, as I have often told you before and now tell you again even with tears, many live as enemies of the cross of Christ. Their destiny is destruction, their god is their stomach, and their glory is in their shame. Their mind is set on earthly things. But our citizenship is in heaven. And we eagerly await a Savior from there, the Lord Jesus Christ. When will this Day of Judgment come? Scripture tells us that no one knows the day or the hour. That’s why the time to accept our Savior is urgent. Time is running out, the wrath of God approaches. Choose life. Choose Jesus. Ezekiel 18 opens with a discussion of a proverb, “”The fathers eat sour grapes, and the children’s teeth are set on edge.” I thought, for illustrative purposes, I’d go to HEB and buy a bunch of sour grapes, but I couldn’t find them anywhere. I guess they were all sold out. Super popular, those sour grapes. Anyway, I bought some Extreme Sour Warheads. I’ll need a volunteer, Chris. I want to try an experiment to see if this proverb is true. Those of you in the class, can you tell how sour this candy is? Does it make your face pucker just thinking about how sour the candy that somebody else ate is? Well, I don’t want anybody to be left out of this face-puckering illustration, so pass the box around and everybody help yourself. Well, I’m going to make an observation that the proverb we’re going to study today is not true. As we’ve seen, just because Chris ate an Extreme Sour Warhead, my teeth were not set on edge, my face didn’t pucker. And like the Lord says, “you will no longer quote this proverb,” it doesn’t appear in the book of Proverbs. Let’s put our lesson today in the context of time – what’s going on, and when. 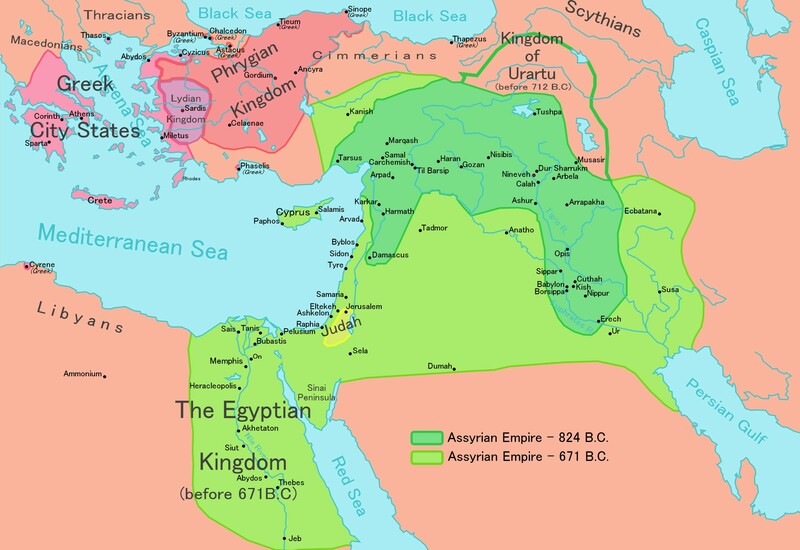 The Assyrian empire was an early world superpower, and at its height ruled much of the middle east, including modern-day Iraq, Syria, Egypt, Lebanon, Israel, Jordan, Kuwait, Bahrain, Palestine and Cyprus, together with large swaths of Iran, Saudi Arabia, Turkey, Sudan, Libya, Armenia, Georgia and Azerbaijan. But with the death of the Assyrian king in 627 BC, civil war erupted. During this time, Egypt regained independence, and then seized Judah and made it a vassal state, and Jehoiakim was installed as king of Judah. But then Nebuchadnezzar and the Babylonians (wouldn’t that be a great name for a rock band?) defeated Egypt during a crucial battle and seized Judah. Jehoiakim must have thought this was a good time to revolt and regain their freedom, but Nebuchadnezzar crushed the revolt, killed Jehoiakim, and took 10,000 Jews, including our prophet Ezekiel, to Babylon. Egypt was still fighting the Babylonians, and they promised Judah military support in another rebellion against the Babylonians. Different factions in Judah developed – some wanted to side with the Egyptians and revolt. Others, including the prophet Jeremiah, warned against another revolt, remain in Babylonian captivity. In essence, the people of Judah claimed that they were not responsible for their own sins. The sins were the result of something their parents did, so they weren’t responsible. The blamed their ancestors and perhaps God Himself, and the people of Judah are simply being punished for the sins of their fathers. The Lord’s Words, of course, are true. In many respects, we are the product of our upbringing and our environment. Whatever life our parents chose to live and the other choices they made have an impact on us, and likewise our grandparent’s choices had an impact on our parents. But while past sins influence our lives for generations, they are not an excuse for our behavior. In other words, we are not always responsible for our circumstances, but we are always responsible for our response to those circumstances. How we react is entirely up to us. “Suppose there is a righteous [Grandfather] who does what is just and right. He does not eat at the mountain shrines or look to the idols of Israel. He does not defile his neighbor’s wife […], he does not oppress anyone, but returns what he took in pledge for a loan. He does not commit robbery but gives his food to the hungry and provides clothing for the naked. He does not lend to them at interest or take a profit from them. He withholds his hand from doing wrong and judges fairly between two parties. He follows my decrees and faithfully keeps my laws. That man is righteous; he will surely live,” declares the Sovereign Lord. In other words, the Lord is pleased with the Righteous Grandfather because he does what is right. But let’s say Righteous Grandfather has a son. We’ll call him the Faulty Father. Righteous Grandfather was so pleasing to the Lord that the Lord will give the Faulty Father some of that good credit, won’t he? Suppose he has a violent son, who sheds blood or does any of these other things (though the father has done none of them): Will such a man live? He will not! Because he has done all these detestable things, he is to be put to death; his blood will be on his own head. So, Super Son’s sacrificial service saves his soul from supernatural servitude in Sheol. Faulty Father may have led a terrible sinful life that surely had an influence on his son, but the son alone is responsible for his actions. If he does what is right, the Lord is pleased with him. “Yet you say, ‘The way of the Lord is not just.’ Hear, you Israelites: Is my way unjust? Is it not your ways that are unjust? If a righteous person turns from their righteousness and commits sin, they will die for it; because of the sin they have committed they will die. But if a wicked person turns away from the wickedness they have committed and does what is just and right, they will save their life. Because they consider all the offenses they have committed and turn away from them, that person will surely live; they will not die. Yet the Israelites say, ‘The way of the Lord is not just.’ Are my ways unjust, people of Israel? Is it not your ways that are unjust? Well, I’m having a little trouble here finding somebody to blame. The Lord says I can’t blame my parents, and I can’t blame my circumstances, and I can’t blame the Lord. Who’s left to blame? Who should they blame? Get a new heart and a new spirit. Rid yourselves of all offenses. Repent and live. God doesn’t pleasure in the death of anyone, including the wicked. God would have all come to repentance, get a new heart and a new spirit, repent and live. God’s message, through Ezekiel, is clear. The people of Judah may object, yes, but they cannot claim they do not understand the message. Repent and live. It’s still the same message. God takes no pleasure in death. Rid yourselves of all offenses, get a new heart and a new spirit, repent and live. It’s been the same message from the beginning. Adam and Eve in the Garden of Eden, hiding in shame due to their original sin. God said, the garden is yours, just don’t eat the fruit of this one tree. And of course they ate it, and then the finger-pointing begins. Adam blaming Eve *and* God simultaneously, “This woman, who you made, gave me the fruit.” And Eve says, “Me? Wasn’t my fault. The serpent tricked me.” And if there was anything about this story that disturbs me is that the serpent doesn’t blame anyone. And today? Here’s a story from Ewing, NJ. Florence Schreiber Powers, age 44, was on trial for shoplifting two watches, and called her psychiatrist to testify that Florence Powers was under stress at the time of the incident and was unaware of her actions from “one minute to the next” for the following 19 reasons: a recent auto accident, a traffic ticket, a new-car purchase, overwork, husband’s kidney stones, husband’s asthma (and breathing machine that occupies their bedroom), menopausal hot flashes, an “ungodly” itch, a bad rash, fear of breast cancer, fear of dental surgery, son’s need for an asthma breathing machine, mother’s and aunt’s illnesses, need to organize her parents’ 50th wedding anniversary, need to cook Thanksgiving dinner for 20 relatives, purchase of 200 gifts for Christmas and Chanukah, attempt to sell her house without a realtor, lawsuit against wallpaper cleaners, purchase of furniture that had to be returned, and a toilet in her house that was constantly running. She was convicted anyway. It’s still the same message. God takes no pleasure in death, rid yourselves of all offenses, get a new heart and a new spirit, repent and live. But in order to do that, we have to recognize the source of our disobedience. Our disobedience doesn’t come from our parents or our location or our circumstance or our friends or our children or our spouse or a cheeseburger or Nordstrom’s or an Apple iPhone or the government or our boss. Regardless of our circumstances, our disobedience comes from within us. But that’s exactly what God would have us do. Say to God, “Look what a mess I did. Look what a mess I am.” And it’s still the same message today as it was in Ezekiel’s time, God takes no pleasure in death, get a new heart and a new spirit, repent and live. We accept the grace and forgiveness through the death and resurrection of Christ Jesus, we receive the Holy Spirit, we get a new heart of forgiveness and humility, we repent of our sins, and we live forever in Him. We do not have to be afraid of the punishment God would have as a sacrifice for our sin. I want to make sure you fully understand this point; there is no punishment, but often times there is God’s discipline. There is a huge difference. Punishment looks backward in anger and wrath and demands a price for the offense. Discipline looks forward in mercy and kindness in order to make our paths straight. If we eat too much, our weight is our punishment, going to the gym is discipline. If we shop too much, credit card debt is our punishment, a budget for future spending is discipline. God does not punish his children, but he may discipline them. What a wretched man I am! Who will rescue me from this body that is subject to death? Thanks be to God, who delivers me through Jesus Christ our Lord! So then, I myself in my mind am a slave to God’s law, but in my sinful nature a slave to the law of sin. Why can we be brave and confess? Because there is no condemnation for those in Christ Jesus. We are not going to surprise God with how bad we are. God already knows. But God so loved the world, including you and me, *especially* you and me, that He gave His only Son, that whoever believes in Him shall not perish but have eternal life. We cry, “Abba, Father.” We can confess freely our sins to God because we have already been forgiven. One of the great mysteries of God’s creation is that if only just admit our sins to God and confess our unworthiness and say, “I did it, it’s my fault, and I’m sorry,” God separates us from those sins as far as the east is from the west, and instead of wretched sinners, we become children of the Living God. Amazing grace, how sweet the sound, that saved a wretch like me. I once was lost but now I’m found, was blind but now I see. Ezekiel’s message to the people of Judah from the Lord hasn’t changed in 2600 years. Stop blaming others, accept responsibility for our thoughts, our behaviors, and our sins. God takes no pleasure in death. Rid ourselves of all offenses, get a new heart and a new spirit, repent and live. God promises to forgive us all trespasses and make us heirs in the kingdom of God. Amazing grace. To God be the glory. Remember when blogging was new? The word “blog” itself was new. The whole concept of people finding an outlet to express whatever was on their mind in a forum that reached globally was new. Now it’s ordinary. People create blogs for their pets now. Or maybe the pets themselves do it, it’s so easy. Today marks the 5th anniversary of the beginning of Chasing the Wind. Happy birthday to us.